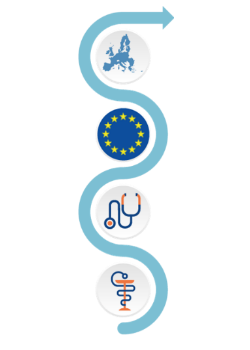 The State of Health in the EU cycle is a 2-year process initiated by the European Commission, designed to improve country-specific and European Union (EU)-wide knowledge in the field of health. In this context, the European Observatory on Health Systems and Policies and the Organisation for Economic Co-operation and Development (OECD) jointly developed Country Health Profiles for all 28 EU Member States. These concise and policy-relevant Profiles are based on a transparent, consistent methodology that uses both quantitative and qualitative data, flexibly adapted to the context of each EU Member State. The aim is to create a means for mutual learning and voluntary exchange that supports the efforts of EU Member States in their evidence-based policy-making. the performance of the health system in terms of its effectiveness, accessibility and resilience. This is the first series of biennial Profiles, published in November 2017. The European Commission has bundled the key findings into a Companion Report. With acknowledgement to the Observatory team responsible for producing the Country Health Profiles - Miriam Blümel, Jonathan Cylus, Cristina Hernández-Quevedo, Marina Karanikolos, Suszy Lessof, Anna Maresso, Sherry Merkur, Wilm Quentin, Bernd Rechel, Erica Richardson, Anne Spranger, Ewout van Ginneken, Gemma Williams and Juliane Winkelmann. The Observatory would also like to thank the members of its Health Systems and Policies Monitor Network for their inputs into the profiles, particularly their help in identifying key health system issues and challenges and for providing review comments on earlier drafts. For more detailed information on country health systems, see the Health Systems and Policy Monitor (HSPM) platform.